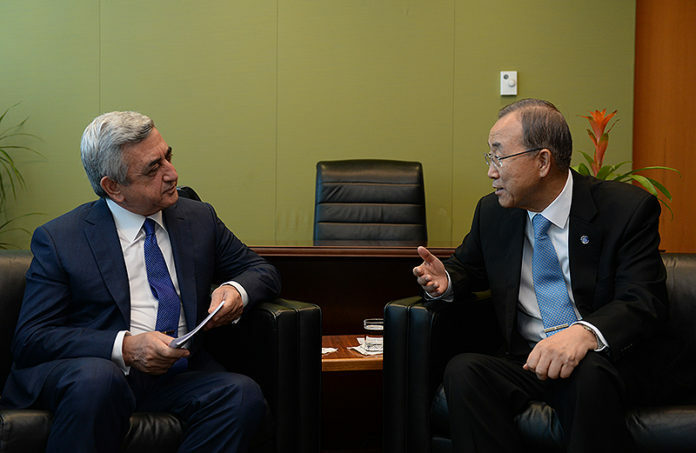 United Nations Secretary-General Ban Ki-moon stressed the importance of a peaceful settlement of the Nagorno-Karabakh conflict, expressing his full support to the activities of the OSCE Minsk Group as he had a phone conversation with Armenian President Serzh Sargsyan on Saturday. According to the presidential press service, during the conversation that took place at Ban’s initiative, the UN chief expressed regret over the postponement of his visit to Yerevan due to “unforeseen circumstances”. Earlier, it was expected that he would come to Armenia on April 25. Sargsyan said, for his part, that the Armenian society has long been looking forward to the UN secretary-general’s visit, expressing a hope that Ban will visit the country at mutually agreed dates. Also yesterday, the UN chief had a phone conversation with Azerbaijani President Ilham Aliyev and addressed the peaceful resolution of the Nagorno-Karabakh conflict. Scores of soldiers were killed and wounded in the fresh escalation of violence in the conflict zone early this month. Despite a ceasefire verbally agreed by the Armenian and Azerbaijani sides on April 5, loss of life in Nagorno-Karabakh continues in sporadic gunfire at the line of contact.